“HSBC’s willful flouting of U.S. sanctions laws and regulations resulted in the processing of hundreds of millions of dollars” in illegal transactions, the Justice Department wrote. Well, it’s been a little more than two years since the deal was announced. Let’s meet the new HSBC. In a little-reported disclosure in December, the Justice Department announced that the government was investigating U.S. taxpayers for evading taxes by using “multi-jurisdictional offshore services” company Sovereign Management & Legal Ltd. The services Sovereign describes on its website, conveniently located atwww.offshore-protection.com, are so brazen that visitors would be forgiven for thinking that it’s an IRS trap. HSBC holds “correspondent bank accounts” for Sovereign’s banks in Panama and Hong Kong, the Justice Department said in December. Correspondent banks are often used to conduct business with banks in foreign countries. On its website, Sovereign lists HSBC among the institutions with which it offers bank accounts. 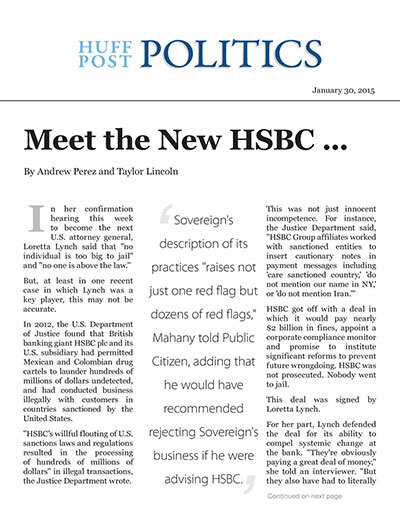 Sovereign’s description of its practices “raises not just one red flag but dozens of red flags,” Mahany told Public Citizen, adding that he would have recommended rejecting Sovereign’s business if he were advising HSBC. In November 2014, Belgian prosecutors alleged that the Swiss private banking division of HSBC had engaged in “serious and organized tax fraud, money laundering and unlawful exercise of the profession of financial intermediary” from 2003 to the present.